Cinema is Forever! : The Most Inspiring Indian Film Debut of Our Time? I am facing strong disapproval from some of my closest acquaintances for not sufficiently admiring a latest mainstream Hindi film. Most around me have loved it and it shows in its box-office performance. Although, I don't mind either - people loving that film and it making money, and I kind of accept why this is happening, I am a little disappointed by their expectation from me to love that film as much as they do. So much so, that I almost contemplated writing a post here on this blog about what according to me were the problems with that film. And let me tell you, those, according to me, were big, glaring problems, which we can ignore only because our own standards as film audience has been very average, to say the least. It has to do with our tastes, and it also has to do with our commerce, and it definitely, and most importantly, has to do with the kind of films that are made in this city, thus sustaining a vicious cycle that has for a long, long time kept our cinema from growing and expand and evolve. The Indian film audience and their approach to the movies is like my Dad's approach to food. He has a certain set expectations from his food. It has to be Indian, North Indian to be specific (as the food from the South doesn't appeal to him), and 'Bihari' to be even more specific (as he is repelled by the idea of cream or milk in the gravy of a vegetable dish, and always prefers ghee over butter). He is very fond of eating, but he won't eat anything outside his strict and limited menu. During his last visit to Mumbai, I made him taste Italian and Chinese food. He vowed never to taste that again. And I can't blame him for that. Our small town and our closed culture never allowed him to develop taste buds for the enormous variety of food from all around the world. And he, almost unfortunately, believes his idea of food to be the epitome of human culinary achievement. So, of course I don't blame my friends who are loving this film as a supreme cinematic achievement, because most probably they are satisfied too easily, not knowing what cinema can achieve when it is driven by pure inspiration, rather than a factory-designed manufacturing unit, trying to fit too many things into what they consider primarily a commercial product. After reading my lines here, most will think I am an 'artsy', pseudo-intellectual, or just too cerebral for conventional taste, or I live in my own world of idealism with the idea of 'cinema that can changes the world' or of a certain kind of cinema that is more 'superior' than others. However, those who know me will agree that I am someone who understands, or is at least willing to understand, the commercial dynamics of films much better than most. I want to love all kinds of films, and do not want to segregate them into art-house or mainstream. And for me, the only purpose of choosing my personal favourites is by trying to figure out the inspiration behind a film and the (cinematic) execution of what inspired the makers, especially the director. Instead of wondering about why I failed to appreciate a certain film, I would request my friends to understand why I appreciate another. I try to stay away from criticising films on public forum and hence I eventually decided not to write about this film in question. And I hope the reasons for me not liking that film can be found in my reasons for loving another film, which is Anand Gandhi's incredibly well-crafted, and confident feature debut, the film that is the talk of the town, and a film that will be remembered forever for what it is. I watched 'Ship of Theseus' today, and am desperate to watch it all over again. Because very rarely you see a film germinating out of conviction as strong and pure as this. Because most of such convictions fail to take the shape of a well-written script, as cinematically promising as conceptually exciting. Because many good scripts suffer at different stages of their translation onto the big screen, and very few end up appearing as one organic whole, a visionary's dream, a poet's verse, an artist's expression. Because modern Hindi cinema is utterly deficient of makers who have such an impressive understanding of framing a shot and controlling everything within the frame, and timing a cut and pacing their work using those cuts, and using the actors as they were real people playing themselves. And most importantly, because we hardly make films that fulfil and satisfy us at all levels - intellectual, emotional, aesthetic, and inspirational. Will 'Ship of Theseus' emerge as a landmark in our film history? Will Anand Gandhi live up to his promise, giving us more films as good as this, if not better? Will this in any way change anything for our audience? These are the questions I don't want to trouble myself with at this moment. All I want is to celebrate this unique achievement by this new voice in our cinema. 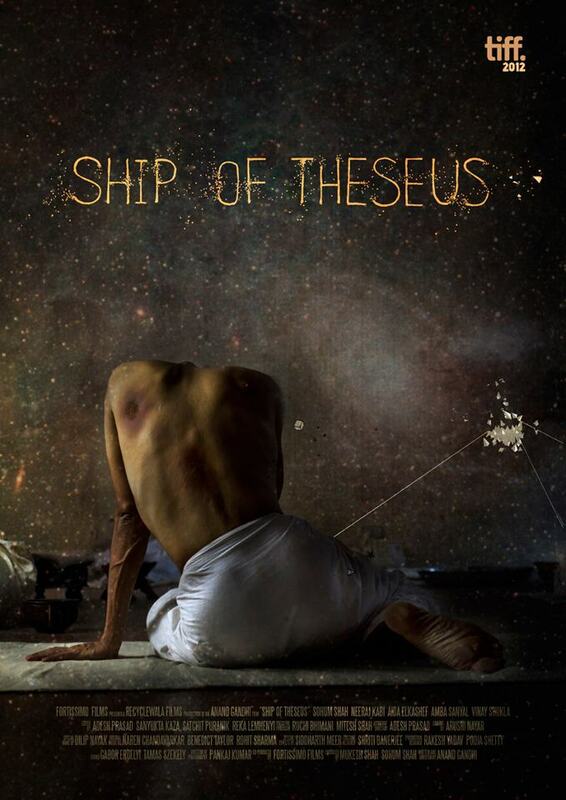 'Ship of Theseus' is not only the best film of the year, it is one of the best Indian films you will see. I hope you do yourselves a favour by watching it. Else, I know you are very happy and content with what is being offered to you on the usual basis, very much like my Dad and his favourite food on his plate. hehe..i love the analogy here! I took my entire batch of students to watch 'Ship of Theseus'. It was an experience! I think this itself proves the conviction of those who backed the release of this film. I really hope, no one loses money on this. If i assume i live a 100 years then i have already lived a quarter of my life, and i think i have lived it quite well with allot of love, giving, ambition and empathy. But never did i think that after spending a good quarter of my life would I be introduced to a new emotion. More so, an emotion i didnt know i had, or was even capable of having. This movie does that and much much more..all i can do is give thanks to Anand Gandhi. And Thank You for such a post...it was so crucially needed.